This is a one of a kind box made from Lacewood and Cherry. It was commissioned for a music composer and designed to accommodate his specific needs for inks, pens and papers. The drawer was designed for the composer's large score sheet papers and notebooks. The upper part of the box has a special deep compartment for ink bottles and other compartments for his writing instruments and tools. The Lacewood used in this box was an especially unique piece. Its rays produce a dazzling three-dimensional effect. The accenting Cherry wood was also unique for its dark lines that ran throughout it. Altogether, a great combo! The trays, dividers and runners in the interior are made from solid cherry wood. Exterior is about 14.75" x 10.75" x 5.5"
Drawer is about 13.25" wide and about 1" deep. The upper level is about 2.75" deep with one full depth compartment and two layers. The bottom layer is about 1.25" deep and is divided into three compartments. The upper layer has a removable tray about 1" deep and also divided into three compartments. 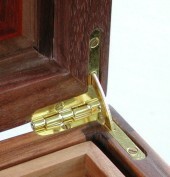 Tongue & groove joints secure the Cherry corners to the Lacewood sides. Top is made of 1/8" Lacewood, inlaid and bordered with Cherry, and laminated to both sides of 1/8" 3-ply plywood. This construction not only makes the interior of the top as attractive as the exterior, but also prevents warping of the top. Tray sides, dividers and runners are solid cherry. Trays and bottom are lined with a luxurious faux suede.